NPBFX (NEFTEPROMBANK FOREX) company provides brokerage services in the Forex market since 1996. Quotes are available for 38 currency pairs, as well as gold (XAUUSD) and silver (XAGUSD) and oil Brent (XBRUSD) & WTI (XTIUSD). 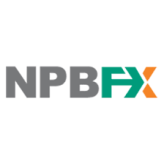 NPBFX serves customers on broker model and become an intermediary between clients and suppliers of liquidity in the interbank foreign exchange market. The company provides customers with the ability to use any trading strategies without limits, from classic trading strategy to HFT and algorithmic trading.